We are using Kentik to analyze our traffic for reporting based up where it's coming from and going to, which allows us to quickly make decisions on where and how to add capacity. We are also using the monitoring and mitigation components to detect and signal mitigation when a ddos occurs on our network.Kentik is very easy to use., classifying interfaces, adding devices and defining alerts is a breeze. Before we started using Kentik, we relied upon user reports and a cli driven interface to detect issues and attempt any sort of mitigation. Kentik has allowed us to setup automated alerts and signaling for mitigation of attacks, which after setting up and tuning, we are now able to automatically mitigate attacks in just a few minutes where it would take much longer before. Kentik has also given us a wonderful interface which we are able to use to at the click of a button pull reports which tell us where our traffic is coming and going from, while at the same time allowing us to share it with our customers with ease. Kentik is very easy to use., classifying interfaces, adding devices and defining alerts is a breeze. Before we started using Kentik, we relied upon user reports and a cli driven interface to detect issues and attempt any sort of mitigation. Kentik has allowed us to setup automated alerts and signaling for mitigation of attacks, which after setting up and tuning, we are now able to automatically mitigate attacks in just a few minutes where it would take much longer before. Kentik has also given us a wonderful interface which we are able to use to at the click of a button pull reports which tell us where our traffic is coming and going from, while at the same time allowing us to share it with our customers with ease. Overall, there are really no major cons that we have come across as support has always been very helpful when we are looking for a new feature or a way to do something. Kentik provides a very comprehensive set of tools and visualization capabilities. Getting everything set up efficiently for a medium to large network takes at least one dedicated person working on it for several weeks. The software itself is very versatile and that is a great tick in the pros column. What I like most though is dealing with the Kentik people. It's very overwhelming at first. It's pretty easy to get past, especially with help from Kentik, but there's a lot that can be done and gleaned from it and it's very intimidating initially. Kentik is a great product, their support is excellent, their product is as well. Kentik is a great product that is a step above the rest. Its easy to use, it quick to setup, its very powerful and can be leveraged for many uses. Kentik is a great product that is a step above the rest. Its easy to use, it quick to setup, its very powerful and can be leveraged for many uses. That its in the cloud and not onsite. If there was a hybrid option that would be useful. Contact Kentik for pricing information. 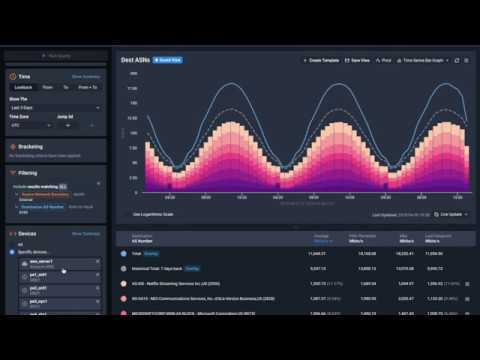 Deep dive into network data with the ability to see every network, all the time, in real time, and gain insight into metrics such as network traffic, network performance, capacity, and more. Allow users to manage their own data analysis by logging into the Kentik Detect self service portal where users can create labels, filter data, and explore the data that they want to see. Create custom dashboards focusing on the metrics that are most important to the business. Define what is monitored, how it is presented, and combine multiple aspects to gain context. Understand data in the context of the business as Kentik correlates real-time network data with wider business and application data. Utilize the Kentik REST API’s to connect with external systems seamlessly, and integrate directly with third party applications including Slack, PagerDuty, and more. Below are some frequently asked questions for Kentik. Q. What type of pricing plans does Kentik offer? Q. Who are the typical users of Kentik? Q. What languages does Kentik support? Q. Does Kentik support mobile devices? Q. Does Kentik offer an API? Yes, Kentik has an API available for use. Q. What other apps does Kentik integrate with? Q. What level of support does Kentik offer?